2014 is not starting off so hot for NYC Vegans... two of my favorite restaurants have closed this month! Last week I walked past Viva Herbal Pizzeria, my go-to Manhattan location for vegan pizza by the slice, only to find the lights off and a for-lease sign in the window. A quick google search turned up a report on its closing from EV Grieve. And now one of my favorite vegan bloggers, Abby Bean, reports that Foodswings has closed too. Foodswings, also known to my friends as "that greasy spoon vegan place" and "the vegan stoner restaurant", was one of my favorite guilty pleasures. None of their food even pretended to be healthy, but it was all so delicious. 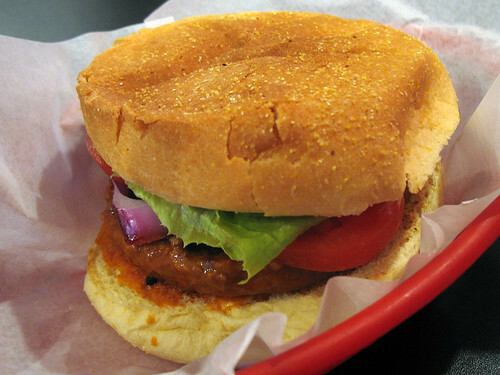 Their veggie burger was one of the first earlist ones that I reviewed back when I started this blog in 2010! Although truth be told, I usually ordered their vegan buffalo wings and a pistachio-peanut-butter milkshake instead of a burger most of the times I ate there. I never even ate buffalo wings before I became a vegetarian, if you can believe that! (I used to be such a picky eater) But in the last couple years I became addicted to Foodswings' wings, and I am deeply saddened to see them disappear. While vegetarianism and veganism are becoming more accepted and more popular, and more non-vegetarian restaurants are offering vegan options on their menus, it is scary to see some of my favorite all-vegetarian/vegan places in NYC being driven out of business by rent costs and other factors. "Vegan stoner restaurant"! Last time I was there (a few weeks ago) there were a couple of guys washing down their feast with 40s. Man, I'm gonna miss that place too.